Despite being a city so known for regimented eating that "San Diego Diet" was Kroll Show's pilot episode, burgers are a big deal here. Whether you like yours straight-up or nestled between two PB&J sandwiches, America's Finest City presents you with no shortage of options. 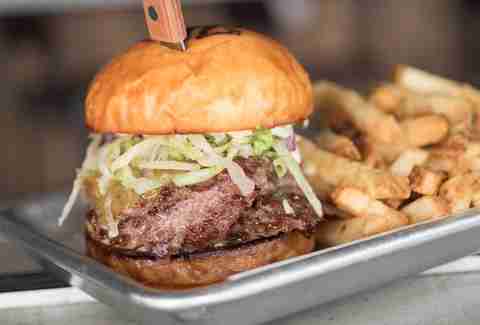 To help you avoid the pitfalls of a "merely okay" beef patty, we’ve taken on the arduous (read: delicious) task of highlighting the burgers you definitely need to try in San Diego. Davanti Enoteca might not be the first place that comes to mind when you’re jonesing for a hot beef injection, but the namesake burger is worthy of a dedicated visit. 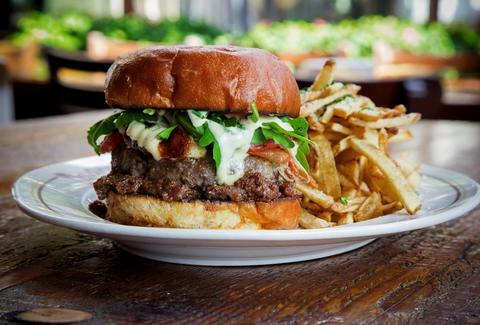 It’s topped with a bevy of exciting additions like griddled cheese curds, bacon jam, aioli, arugula, and confit tomato. The kitchen takes its burger game seriously, so if you like to see a little bit of red in the center of your patty, go ahead and order yours medium-rare. The one drawback is the shoestring fries. They’re a bit flavorless next to the patty, but perfectly delicious dipped in aioli (ask nicely for some on the side). This massive burger demands an open mind and a completely empty stomach. 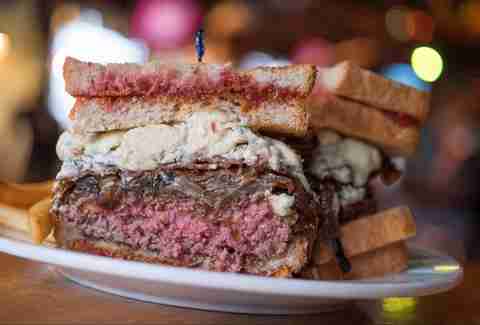 Between two PB&J sandwiches (made with Sriracha-infused peanut butter and strawberry jam) is served a full pound of griddled Angus chuck topped with grilled onions, four strips of bacon, and a generous scoop of gorgonzola cheese. Even if you’re not convinced you can finish it in one go, you still need to try it at least once. 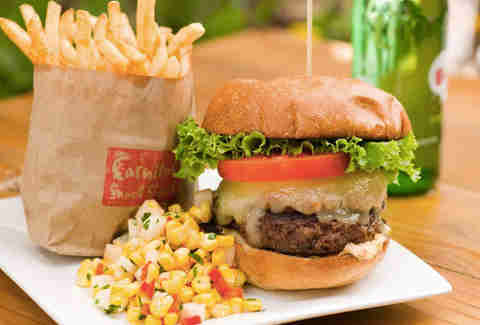 The savory, salty, and sweet flavors work surprisingly well together, resulting in a burger that’s shockingly delicious. The namesake burger at this local chain is always a tasty option. It’s topped with the standard lettuce and tomato, but things get more exciting from there with the addition of smoky bacon jam, white cheddar, and aioli. The end result is a burger that is straightforward enough to appeal to purists, but so well-designed (and well-executed) that even the hardest to please critics can’t deny its beauty. Hodad’s has been a San Diego institution for decades for all of the right reasons. 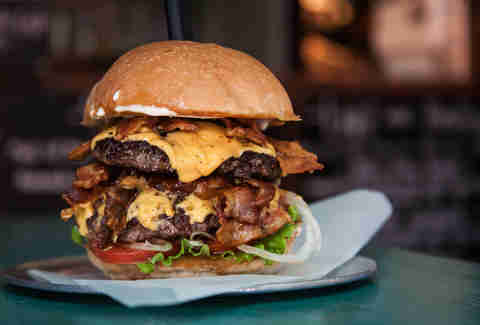 Just look at this deeply satisfying burger, would ya? With the toppings taken into account, it weighs in at just shy of a pound, every ounce delicious. Two tips: get your onions grilled (it will make the burger more manageable to eat), and never remove the wrapper under any circumstances. A milkshake and fries (or "frings" -- fries and onion rings) are both highly recommended sides. When you crave a no-frills burger done absolutely right, this casual spot just steps from the greens at Torrey Pines is the place to go. 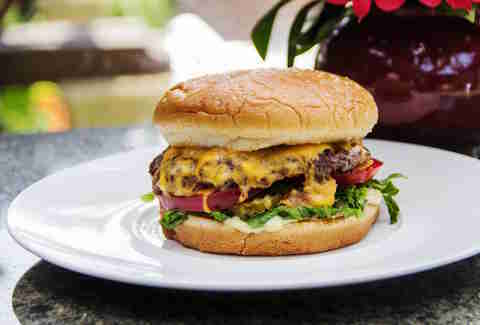 The Grill’s Drugstore Hamburger stars 7 ounces of Niman Ranch ground chuck topped with lettuce, tomato, onion, pickle, and mayonnaise on a sesame seed bun that’s briefly steamed in the beef fat and the juices that pool below the patty as it cooks. 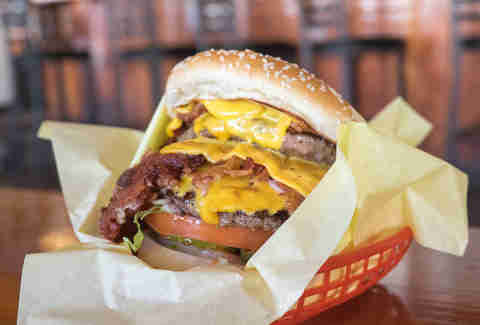 No fancy gimmicks, just (arguably) the best classic burger you can get in San Diego. Adventurous diners will appreciate this juicy grilled lamb burger topped with an eyebrow-raising (and strangely delicious) assortment of toppings, including blue cheese crumbles, mint jelly, tomato chutney, garlic aioli, and pickled beets -- all nestled between a toasted rosemary focaccia bun. If that's not enough, you can top your patty with a sunny-side-up egg for an additional charge. The lamb burger comes a la carte, and while fries won’t be necessary to fill you up, order some sweet potato spuds topped with blue cheese crumbles anyway. You can get the same burger from Bare Back Grill in PB; Queenstown Public House in Little Italy offers a similar, though slightly stripped-down, version. The destination-worthy HP burger constructed by Chef Brad Wise features two well-seasoned beef patties, bread and butter pickles, shredded iceberg lettuce, shaved red onion, sharp English Cheddar, and HP sauce (Dijon and mayo) smeared on top of a toasted challah bun that’s made in-house. Wash it down with a boozy milkshake, or a Fugu vodka slushie with ginger and lime. When you’re craving a no-nonsense burger with a side of dive bar ambiance, head straight to this low-key option in Bankers Hill. Inside, you’ll find dim lighting, comfy seating, and some of the best burgers in town. 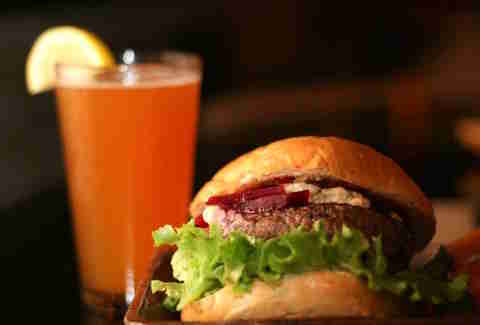 During happy hour (4-6 pm daily) a classic Balboa burger can be yours for just $5. If you want to up the stakes, try a pastrami burger or The Centennial, which is stacked sky high with a double dose of meat, bacon, and cheese.